In 2012 I discovered Bangkok’s most gluttonous secret. Food. I’m not just talking about any food though, I’m talking about French food. Yes, that’s right, French food in Bangkok. This secret is almost so good that I don’t want to spread the word, I want to keep it to myself. Atop the recently opened Sofitel Sukhumvit Bangkok on extremely busy Sukhumvit Road sits French concept restaurant. L’Appart, or the Apartment, has several rooms, just like an apartment, including a library, a living room, a kitchen and dining room. The restaurant feels like a place you would call home. It is based on a Haussmann-style apartment (Haussmann buildings are also referred to as pierre de taille or cut stone) with beautiful decorative finishes, wooden floors, and fireplaces. I first found L’Appart during their soft opening in mid-2012 and instantly fell in love. In fact, I went back 2 more times in the first two weeks they were open. The food is absolutely stunning. Jeremy Tourret serves as Executive Sous Chef at L’Appart and his kitchen, which is visible to diners, is a work of art. The kitchen is decorated in black and reds and is quite warm and welcoming – like a kitchen should be. Since the soft opening, I’ve been back on every trip I’ve made to Bangkok – so in total, I’ve eaten here 6 times now and will keep going back. 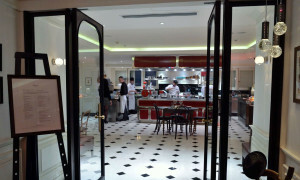 The menu at L’Appart, created by chef Tourret, changes about every two weeks. According to hotel General Manager Christian Schlegel, who I met during my second visit, Tourret cooks food that inspires him – food that he loves. And it shows. Every plate is a masterpiece. And I’m not the only person who believes this. 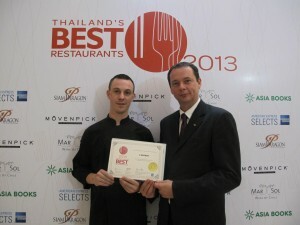 Just this week, L’Appart was voted Thailand’s Best Restaurants 2013. To me, it’s evident why – the food is star of the show. Last night I dined with two friends at L’Appart. The bar was crowded, filled with Thailand’s affluent young professional crowd and tourists who were enjoying a special champagne event – three hours of bottomless champagne for the low, low price of 2,999 baht (the equivalent of about $100 USD). I suppose if you planned to drink a lot of champagne, it would be a good deal. Tons of people were enjoying champagne. We sat outside at the rooftop bar and enjoyed a mojito. Inside, we sat in the kitchen with a perfect view of all the action. I had been dreaming of the french onion soup since my last visit, so I was thrilled when it was still on the menu (and at the end of the meal, I told Chef Tourret to make sure it was still on the menu in May, when I return.) It’s literally the best French Onion soup I’ve ever had. The presentation is awesome and the flavor, divine. 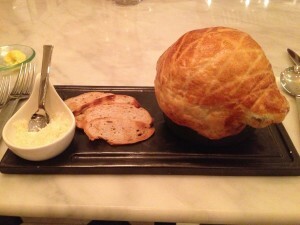 The soup comes to the table in a bowl covered with a puff pastry. The staff gently cuts away the shell revealing the steaming soup. For my main course, I chose one of the most indulgent options on the menu. 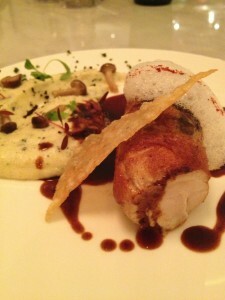 Slowly cooked chicken with with foie gras and black truffles accompanied by creamy pollenta. It was beautifully presented and tasted out of this world. The dish was by far one of my favorite main courses ordered yet – it’s up there with the lobster cooked in lemongrass butter served with oyster and potato mousseline. On this occasions we did not order dessert, but at the end of the meal complimentary house-made marshmallows and jelly candies are delivered to the table. While I’m not a huge fan jelly candies, I love seeing them because they bring back a great childhood memory of sitting on the porch with my grandfather and uncle eating jelly candies from their candy factory. The marshmallows are really good. The only drawback to L’Appart is the service. It starts out great, but without fail, every single time I’ve dined here the service takes a drastic turn for the worse towards the end of the meal. Last night we sat for over 20 minutes with our dirty dinner plates sitting in front of us for 20 minutes before a manager came over and asked if we were done. There was nothing left on anyone’s plates….we were done. Then, it took about 15 minutes before we were able to flag down anyone to bring over a check. It took a while to get someone to come back and run our credit card. The first time I had the experience I shrugged it off and said, “they’re working out the kinks.” The second time I said, “they’re really busy” now, it just seems quite consistent and is a huge let down. If Chef Tourret hopes to reclaim the title of Bangkok’s best restaurant 2014, they’ll need to maintain consistent service throughout the entire meal – not just at the beginning or when it’s slow. Overall, I still think the food is the best French food I’ve had in ages and is a hidden gem in hot & steamy Bangkok. Go for the food, you’ll love it! 1 Comment on "Bangkok’s Most Gluttonous Secret"
This sounds amazing. 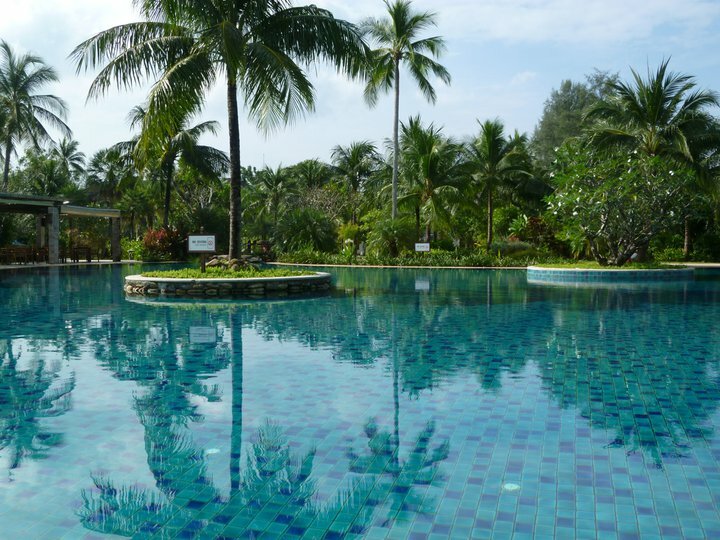 I’m adding it to my list for when my husband and I visit Thailand.